The best wheelchair accessible homes are designed to allow maximum mobility inside and out. And it all begins at the driveway and walkway leading to the front porch or front door. Universal design has now become the standard for creating easily accessible homes. Mary and I interviewed Suzanne Taylor, a certified Aging In Place Specialist, with Taylor Made Custom Contracting in Jarretsville, MD. Suzanne helps us understand what universal design means, what is an accessible home and factors to consider for wheel chairs, wheel chair lifts, and for building wheel chair ramps. Although too steep for a wheelchair, the ramp to the front porch above might be satisfactory for a scooter. This is not a Taylor Made Custom Contracting product. 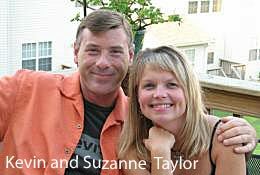 We are delighted to share with you excerpts from our interview with Suzanne. Mary and I know you will glean not only new insights into wheelchair accessible homes but also some new ideas you can use for your home and porch. Suzanne: Universal design is actually a concept of creating an attractive living space that is functional for everyone regardless of their age or their physical abilities. There are many different products and services that can be designed to incorporate into the home, to make it beautiful yet functional. Certified Aging In Place Specialists and the National Association of Homebuilders are experts in wheelchair accessible homes specifically designing home modifications for people within their home. Dave: We're all about porches obviously, so what kind of things should homeowners consider to have wheelchair accessible homes? Suzanne: When one of the terms that the ADA (Americans With Disabilities Act) uses is called the path of travel, that is, the path from the car to their door. When you are looking at possible design or home modifications, you want to really consider how a person is going to be able to get from the car to the house. Using the universal design approach means we can create functional entry ways that are beautiful. They can be designed out of flagstone, stamped concrete, and of course wood or composites. A lot of times people think ADA requirements mean that something has to take on a kind of hospital type look. And that's not necessarily the case. The entryway can be gorgeous while simultaneously helping people of all ages and those with limited mobility. Mary: Wouldn't it be awesome that homes were built that way from the beginning? Suzanne: That's true, and a lot of the 55-year and older communities do have that universal design concept in mind and they do use that quite a bit. Dave: Just for clarification, ADA requirements are not required for residential homes, is that correct? Suzanne: Yes, you are absolutely right. ADA requirements apply only to commercial structures and are recommendations for private residences; they are not requirements. Dave: Hopefully you will agree that people should really try to come close to meeting ADA requirements as possible because they have been developed over time by experts in the field. So even if you're doing something in your own home it would be prudent to use ADA requirements for your safety purposes. Suzanne: Absolutely. If you're building or remodeling your house, even if you're in your 20s or 30s you won't necessarily need to remodel later in life as all of those things would already be in place. Actually when we built our home, we remodeled it when we were in our mid 20s and our home has all ADA recommendations. We have 36 inch doorways, no thresholds, and other modifications throughout our home. We actually have a closet in our oldest son's bedroom that was purposely designed so that, if needed, in the future we could install an elevator. Mary: We talked about that residential homes do not have to follow ADA rules. But what about local building codes and Home Owners' Associations? Dave: That's a great question and brings up a good point that when you are building something like a ramp it would not hurt to check with your local building codes just to make sure you're in compliance. Mary and I know having lived in all parts of the country those codes differ a lot depending on where you live. Suzanne: And they vary from county to county, just like you said. Double check because you're better off being safe than sorry; if you start and you've made a mistake the permit office can shutdown your project. That is not something that you want to have happen. Dave: Also, check with your Home Owners Association too. They wield power and can also stop your project. Concrete ramp leading to front porch as an extension of the walkway and porch steps. Again, this ramp is too steep for wheelchairs and if built to ADA standards, should be approximately 28 feet long. Mary: Wheelchair ramps are typically not very appealing due to their size. Suzanne: You are exactly right, most people think they are not attractive mostly due to their configuration. Probably the biggest challenge is the wheelchair ramp slope because it has to be a 1:12 inch ratio. It cannot be too steep for the wheelchair to maneuver so that does end up taking up some space. There are some ways of working around that such as having more than one landing. Wheelchair Slope: A "1 to 12 inch ratio" means that for every inch in height, the wheelchair ramp must be 1 foot long. For example, if you porch floor is 21 inches from the ground (approximately three steps) the ramp must be at least 21 feet long. Learn more about wheelchair ramp slope and designs. 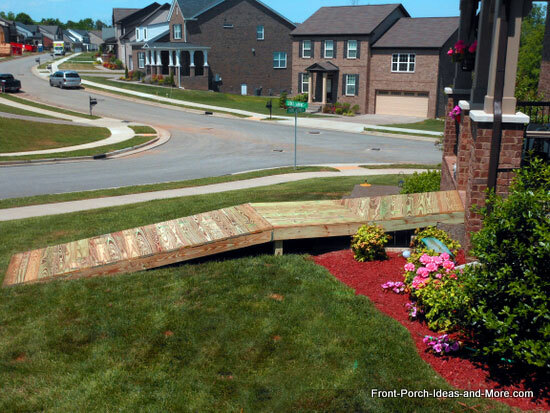 But again, ramps can be made of concrete, wood, vinyl, aluminum or composite. A lot of the new decking today is composite because it doesn't degrade or stain. You can choose from various colors which won't fade. Mary: I think of a wheelchair ramps as being an add-on to the porch or home rather than part of the home itself. Is there a way of incorporating the ramp right in with the design of the porch, rather than it being an add-on? Suzanne: We had a recent project where we created a flagstone entrance using the correct slope. Now when you look at the home, you don't think ramp. You just think, "Oh, this is just a beautiful entryway." But yet it is still wheelchair accessible. Here's a wheelchair ramp a friend and I built one morning for our neighbor. Although it does not totally comply with ADA requirements, it meets the owner's requirements and we believe is minimally intrusive to the neighborhood. 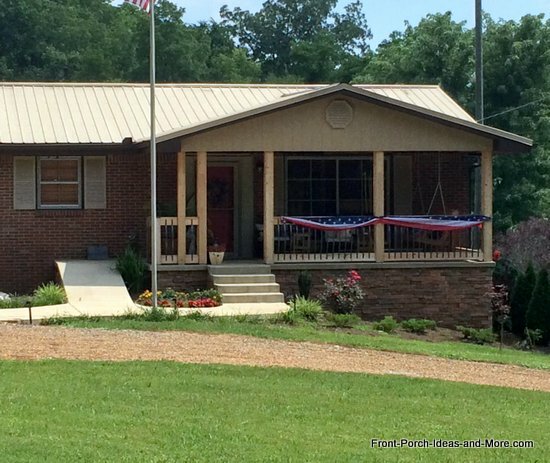 It is a good example of a wheelchair accessible home starting at the front porch. Suzanne: A wheelchair porch lift might be an option if you really have a limited space and need a wheelchair accessible home. You only need a 4 foot x 4 foot area if space constraints are really an issue. Mary: If I was needing to have either a lift or a ramp, what are some of the pros and cons? 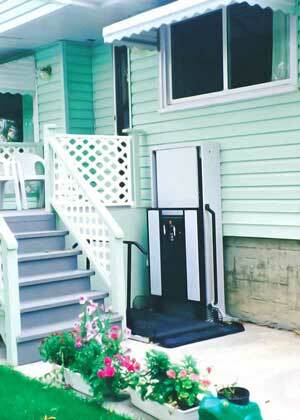 Suzanne: Space issues are probably the best reason for choosing a wheelchair porch lift. Because they only need about 16 square feet, they are ideal for almost any porch. A wheelchair lift requires electricity. So you would definitely have to have a dedicated circuit for that and just like anything mechanical, there is potential for mechanical failure, that is, needing new parts over time. You have to make sure that you have a gate for the wheelchair lift, so if the wheelchair is at the bottom you need to make sure that gate is placed at the top and vice versa. You don't want to have any problems or any accidents. Ramps do not require electricity and you can choose any material that you would like. Some people choose composite as we discussed earlier or concrete but they do take up a large amount of space. So it really depends on the individual application. Mary: If it comes down to money is there a big difference between a wheelchair ramp and porch lift? Suzanne: That's a really good question actually. I would say they are probably similar in price. Now the wheelchair lift would probably cost about $8,000 roughly, give or take depending on height. Obviously the higher it goes the more expensive it is. The cost of a ramp is dependent on length and on what material you choose. Vinyl or concrete would be more expensive than composite or pressure-treated wood. Dave: I just want to stress for our listeners that a porch lift requires a dedicated electrical circuit. If folks are thinking about wiring it themselves, they need to understand it has to be on its own circuit. Suzanne: I would definitely recommend a porch be at least 6 feet deep because we want to able to maneuver around without any space constraints. Another good universal design idea for porches is to raise the height of outlets and lower heights of switches. Often people have outdoor ceiling fans and table lights on their porches. It is really nice to be able to turn them on or off with accessible switches. Mary: Sounds like our porch. Fans and lights, we love fans and lights. Suzanne: Stick to flooring options that are wheelchair friendly. Concrete or composite are great but vinyl or brick probably isn't the right application. Just make sure that thresholds are not any thicker than one-half inch, because we want to be able to maneuver over them easily. Mary: Our porch floor is concrete. When we had our home built instead of making a step into the house they just sloped the concrete up to the door so our threshold is minimal. 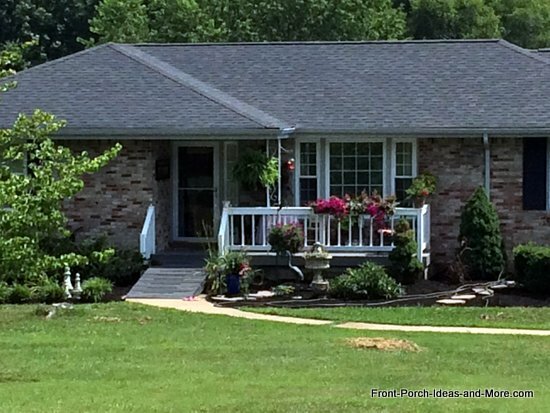 Mary: Suzanne, Dave and I love porches and I bet that you do too. So do you have any stories in regards to living on the porch or just enjoying your porch? 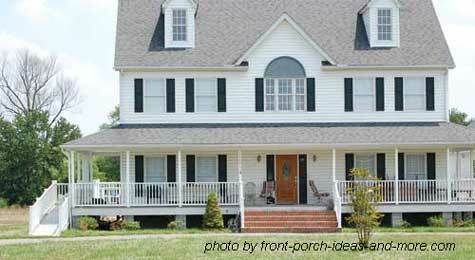 Suzanne: I didn't have a porch growing up however I always wanted a wrap around porch. When we built our home in our 20s, we decided to put a wrap around porch on it. It is funny because that is the one thing that everyone loves about our house. And they say, "have you seen the Taylor's wraparound porch, it is the most gorgeous porch you have ever seen". So everyone that knows our house, knows our porch. It has its own personality in addition to the house. We have had so many parties on our porch. We have done bridal shower parties, we've done engagement parties, baby shower parties and everyone just loves being outside. Mary: Porches just mean so much to people and they are just happy places. And I just like to thank you so much for taking your time today and sharing a wealth of information with us about how to make your porch and the entryway of your home more accessible, not only for people who have limitations, but even as young people. It's a great way to plan your home and I love the story that you told us about your own home. Wheelchair accessible homes are the way to go for families nowadays. Dave: It has been great and Taylor Made Custom Contracting is definitely a company that those in the Baltimore Maryland area should contact if looking for wheelchair accessible homes, front porches, or remodeling projects inside and out. I also want to let people know you are an approved builder for the department of Veterans Affairs, especially adapted housing programs which is really a feather in your cap. If you'd like more information about wheelchair accessible homes and porches and live in the Baltimore, MD area contact Suzanne or Kevin at Taylor Made Custom Contracting through their website: Taylor Made Custom Contracting. Be sure to check out Taylor Made Custom Contracting's amazing and beautiful front porch designs too.